I was there in the Bagdogra airport that day, Sir. The rains had forced cancellation of trains, and the airport was struggling under the passenger loads. The Gorkhaland agitation has the Darjeeling parts and roads closed up and disturbed for about 2 months now. I had my Sikkim trip to Majhitar, and was able to catch sight of the new hilltop airport for Gangtok only from a great distance, from a road down below. For Sikkim, only this National highway is open, and that too with the landslides, is not easy to traverse. (We got stuck up in Siliguri for a day). SK-marked licence plate vehicles are primarily plying the route, with WB-marked ones in danger of being burnt. Thanks for the input and support. New Delhi, Aug. 20 (PTI): Dozens of flights were affected today as aviation operations were suspended twice at the Delhi airport after "drone-like objects" were spotted on its runways. Indira Gandhi International Airport, the country's busiest, saw the operations getting halted for an hour in the morning and around 45 minutes in the evening, sources said. Following the shutdown, two Air India flights were diverted to Lucknow and Ahmedabad while one each of GoAir and IndiGo was diverted to Jaipur. Around 11.15am, a pilot of a China Airline flight coming from Taipei to New Delhi noticed a flying object on runway 28/10 at the time of landing. The runway was then shut for operations from 11.20am to 20 minutes past noon, airport security sources said. The China Airline could not be immediately contacted for comments. A "drone-like object" was again spotted around 7.10pm, this time by AirAsia pilots. The operations were suspended on all three runways of the airport for around 45 minutes. The flight operations resumed at 7.55pm after clearance from Delhi police, the sources said. An AirAsia India spokesperson said the pilots of a flight from Goa to New Delhi spotted the "unidentified object" flying close to the aircraft while landing on runway 11. "Our pilots followed normal procedure and carried out an uneventful landing. Upon landing, the pilot reported the incident to the air traffic controller," the spokesperson said in a statement. The airline has filed a report with aviation regulator DGCA. Delhi police said a case would be filed. "We will be registering a case under Section 188 of the Indian Penal Code," DCP (Indira Gandhi International Airport) Sanjay Bhatia said. Section 188 deals with disobedience to an order promulgated by a public servant. The DGCA has banned the use of unmanned aerial vehicles, which includes drones, for commercial use. Comment: Whats going on babus ? Runway space around the DEL, India’s largest airport is high security area. Nowhere commercial drones are allowed in active airport areas! KOLKATA: The Indian Air Force has without any fanfare added more teeth to its capabilities in the east by commissioning Air Force Station Arjan Singh in Panagarh, about 150km northwest of Kolkata, in the middle of the stand-off with China in Doklam. AFS Arjan Singh became fully operational, with its full complement of six C-130J Super Hercules strategic aircraft, in the last week of July. The Doklam stand-off with China started a month earlier. Panagarh is the second location in the country, after Hindan in Ghaziabad, to have a base for the C-130J aircraft. Technicians and engineers from Lockheed Martin have been building hangars and other facilities for these aircraft at Panagarh for over two years. A senior IAF official in New Delhi said an Ilyushin Il-78 mid-air refueller has also been based at Panagarh to extend the endurance of Eastern Air Command (EAC)'s fighter fleet, particularly the Sukhoi Su-30 MKIs. "The first of the C-130Js started arriving in India in 2011 and the first squadron (Veiled Vipers) was based at Hindan. These aircraft are considered among the most versatile in their class, capable of landing with troops and equipment at Advanced Landing Grounds with short runways close to the Line of Actual Control with China in India's northeastern states. The Super Hercules is not a mere transport aircraft. It is a strategic asset that can deploy troops in hostile territory at extremely short notice," another IAF officer said. The hangars and other facilities at the bases at Hindan and Panagarh are hush-hush affairs not without reason. Entire Special Forces units with equipment bunk in air-conditioned quarters below the hangars. This enables them to mobilise within minutes and board the aircraft that are kept ready for take-off at any point of time. When not in actual operation, Special Forces personnel train both with and without the aircraft. "Panagarh is crucial also because the Indian Army's newly raised 17 Strike Corps is to be headquartered there. Panagarh will also have one of the two high-altitude infantry divisions (59 Division) of the Corps The 17 Strike Corps is being raised keeping in mind threats from across India's northern border. All these make AFS Arjan Singh a key strategic location. It is being kept at a state of full preparedness for 'short and swift' operations," the officer added. The IAF believes that commissioning of AFS Arjan Singh will raise eyebrows across the LAC but officers maintain that it is all part of a schedule that has nothing to do with the present situation. However, assets like Il-78 refuellers are deployed for better preparedness during contingencies. With squadrons of the Mig-21s and Mig-27s being gradually phased out, the Su-30 MKI has become the mainstay of the EAC. These air-superiority aircraft have a range of 3,000km that can be more than doubled by mid-air refuelling, thereby increasing their potency manifold and enabling them to launch strategic weapons. Comment: A very positive development indeed! India needs a total air supremacy in the Bhutan/Sikkim tri junction area to stop any Chinese misadventure. Also large scale PLA movement in Tibet could only be neutralized by long range Su-30 aircrafts operating out of Hasimara, Bagdogra, Tejpore air fields. Uneducated politicians of Waste Bengal should shut up! The government on Wednesday said the Hindon Air Force base in Uttar Pradesh’s Ghaziabad may be used to connect regional destinations to the national capital in future. According to Civil Aviation Secretary R.N. Choubey, the Ministry of Defence has agreed to provide the Air Force base for flight operations under the second round of the Regional Connectivity Scheme (RCS-Udan). However, the IGI airport operator DIAL (Delhi International Airport Limited) has to be taken “on-board” for the new arrangement to be implemented. Comment: This will reduce pressure on IGI airport. But DIAL may not accept another functioning civil airport so close to DIAL. BENGALURU: Come tomorrow, and the first English Electric Canberra jet inducted into the Indian Air Force (IAF) will turn 60. The first generation Jet Bomber was manufactured in a large number through the 1950s. "The prototype of Canberra first flew in May 1949 and in January 1957, and the aircraft was selected by the Indian Air Force to equip its bomber and strategic reconnaissance fleet. The Canberra Jet bomber was first inducted in the IAF in No. 5 Squadron (Tuskers) at Agra on 01 September 1957," the IAF said in an official release. When political turmoil broke out in Belgian Congo in 1961, the UNO requested India for strike aircraft and within five years of serving the IAF, on October 9, 1961, under the command of Wing Commander AIK Suares, six Canberra aircraft of No 5 Squadron took off from Agra for Leopoldville, over 6000 km away to join the United Nations' Multinational Force in the Congo. "This was the first-ever Indian fighter-bomber contingent to take part in UN operations. The offensive operation in Congo earned the Squadron two Vir Chakras, one Vayu Sena Medal and five Vishisht Seva Medals," the IAF said. The Canberras took part in all major operations, including the liberation of Goa in 1961, the 1965 and 1971 Indo-Pak wars, 1987 Op Pawan in Sri Lanka, 1988 Op Cactus in Maldives and 1999 Kargil war. On December 18 1961, Canberras of No 16 and 35 Sqn bombed the Dabolim airport forcing Portuguese forces to surrender. The Canberra last saw action in the Kargil war in 1999 where it flew recce missions. During one of the missions one aircraft's engine was hit by a missile. The sturdy Canberra could survive the enemy's missile attack and landed safely with all vital information. During its service, Canberra provided invaluable photo reconnaissance inputs of enemy territory during wars and peacetime operations, resulting in accurate and effective operations. After 50 years of glorious service to the Nation on 11 May 2007 at Air Force Station Agra, the IAF bid adieu to its legendary old war horse. Comment: Yes, both in Goa in 1961 and Bangladesh War in 1971 pounding by Canberra bombers shortened the war considerably. They have a glorious past compared to Vampire jets, another jet bombers IAF used in those days! A Rs 88-crore solar power generation plant that is under trial at Kolkata airport is set to propel it ahead of its peers in the country . Once it connects to the CESC grid, it will be the largest source of alternative energy in Kolkata. Speaking to TOI, Kolkata airport director Atul Dikshit said the solar-harvesting facility was undergoing tests before pushing power into the CESC grid. Altogether, 45,454 solar panels, each of 330W capacity , have been installed across 65 acres to the east of the primary runway . The plant has a peak generation capacity of 15MW solar power. It is expected to generate 1.3 million units of electricity a month, enough to light up a locality with 1,000 homes. This is the second solar plant at the airport. A couple of years ago, it had commissioned a 2MW rooftop plant -at a cost of Rs 10.5 crore -that currently powers lights at the airport. “We have signed a net-metering agreement with CESC and hope to make substantial savings on our electricity bill once the plant is commissioned,“ Dikshit said. Net metering is a billing mechanism that credits solar energy system owners for the electricity they add to the grid. Since the airport uses more electricity that it will generate, the difference between the electricity supplied to it by CESC and the electricity the airport exports to the grid will be factored into the bill. According to rough estimates, the airport's electricty bill should come down from Rs 6 crore to Rs 4.75 crore a month. The annual saving will be Rs 15 crore. CESC confirmed that the airport was poised to become its biggest supplier of solar power and will be critical for the company to meet its solar obligation. At present, the quantum of solar power in the the CESC grid is currently around 8.5MW . Prior to the installation of the solar panels, a glare analy sis was carried out to ensure that sun's reflection doesn't distract or disturb pilots. It is only thereafter that the site location and height of solar photovoltaic modules were decided. “Solar glare was a concern for pilots but technological advancements have led to a substantive reduction in the reflective index of panels,“ a pilot said. Setting up a solar unit in a city is major challenge owing to space crunch. Airports have, therefore, emerged as suitable sites for solar harvesting as it has to mandatorily leave large tracts of land vacant next to runway for operational safety. Comment: 65 acers has been invested for generating 15MW electricity.! With a saving of 15 crores per year. I have no problem with that but remember there are apron space and taxiway space shortage in the airport.Solar farm should have been developed in a remote area like Sunderban, leaving that valuable space near the main runway for apron and taxiway construction.AAI think hard!. Bhutan Airlines flight B3-701, carrying 67 passengers, five flight attendants and two pilots, had barely begun taxiing towards the runway around noon when the pilot of a just-landed IndiGo flight from Imphal saw the smoke. Airport officials said the pilot of the Bhutan Airlines flight immediately sounded three "Maydays" to air traffic control. Four chutes or evacuation slides were deployed and all 74 people were brought out within 90 seconds in keeping with international aviation protocol, airport officials said. Some of the passengers and crew members suffered minor cuts or bruises. Officers of the coastguard's airport unit were inspecting their hangar when they saw passengers sliding down the chutes and "screaming in panic", deputy commandant Pankaj Mishra said. The coastguard unit took some of the passengers into its ambulance and provided first aid. The directorate-general of civil aviation has ordered a probe. An airline spokesperson said the smoke, "which was seen coming out... around the APU (auxiliary power unit) area... soon dissipated by itself". "The aircraft was thoroughly inspected by our flight engineer (who) found no major damages," following which the pilot flew the empty aircraft to Bangkok for further checks. "Another aircraft came from Paro (Bhutan) to take the stranded passengers to Bangkok," another airline official said. The flight had arrived in the morning from Paro and was parked, attached to an aerobridge, at bay number 59. At 11.55am, it began taxiing. IndiGo's Imphal-Calcutta flight had landed minutes earlier and was taxiing from the runway towards the parking bay. "The IndiGo pilot saw the smoke and alerted air traffic control before speaking directly to the Bhutan Airlines pilot," an airport official said. An A319 aircraft allows six chutes to be deployed at a time - four for the doors and two for the two exit windows. But since the number of passengers was low, four chutes were used, sources said. Images of passengers sliding down chutes had been beamed to global TV audiences on January 15, 2009, when a US Airways Airbus A320-214 struck a flock of geese minutes after takeoff from New York and lost all engine power. Pilots Chesley Sullenberger and Jeffrey Skiles somehow crash-landed the plane on the River Hudson. All 155 people on board slid down chutes and were rescued by nearby boats. COMMENT: A timely action by the pilot! Sept. 17: Calcutta contributes between 400 and 550 passengers daily to airlines flying to Europe from elsewhere, yet no carrier sees a business opportunity in the statistic. "We have been studying the market to Europe for more than a year. The volume of passengers is enough to fill at least one flight, but the traffic is not evenly distributed throughout the year. It is mostly seasonal movement of tourists and students," said a senior official of Calcutta airport. According to the survey, between 1.5 to 2 lakh people fly out of the city annually to other cities and take connecting flights to Europe. The route of choice for most is through Dubai or Doha. Some travel via Delhi or Mumbai and a few through Singapore and other Asian cities. The state government and the airport authorities have tried to convince several airlines to explore the opportunity of starting a direct flight from Calcutta, but the response every time has been that it is not feasible. "We have the infrastructure to handle direct Europe flights, yet no airline has approached us for this," airport director Atul Dixit told Metro. Chief minister Mamata Banerjee had asked the airport director for an update on the initiative to bring a direct flight to Europe on her way to north Bengal on September 11. According to officials, Mamata, before boarding the flight to Bagdogra, had asked Dixit whether there was "any development". When the airport director said there was none, the chief minister asked whether Jet Airways, whom she had requested to start a direct flight to Europe, had shown "renewed interest". Jet Airways said it was not yet looking at the possibility. "We have good connectivity to Europe from Delhi and Mumbai and we connect Calcutta passengers to these flights through our strong domestic network," a Jet official said. Air India, which not long ago had expressed interest in starting a direct flight to London, said there was no such plan at the moment. The airline last week started a flight between Delhi and Copenhagen. For Calcutta, the consolation is an extra Bangkok connection. "We do not have immediate plans to start a London flight from Calcutta because of operational reasons," an Air India official said. Industry-starved Bengal does not provide enough business travel to ensure year-long occupancy for an airline. Also, unlike budget tourists or students, business travel is less price-sensitive and ensures that high-yield seats do not go empty. British Airways and Lufthansa had withdrawn from Calcutta because of the yield factor. Both airlines were getting economy passengers, but not enough business-class travellers. According to tour operators and officials of various airlines, the travel pattern from Calcutta to Europe and the US is such that the hub-and-spoke model works out best for carriers. "Calcutta adds to the passenger volume of airlines from their respective hub. 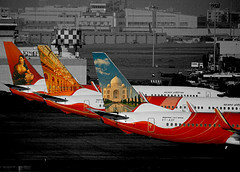 Some passengers prefer Delhi or Mumbai because they get a lot of choices and, therefore, cheaper fares. Even if one flight starts operating, the price factor would still take a chunk of these passengers to Delhi and Mumbai," said Anil Punjabi, chairman (east) of the Travel Agents' Federation of India. Comment: This report is nothing new but an old wine in new bottle. Unless there is renewed industrialization there is no hope for direct flight to Europe. It is a fault of Bengal’s domestic politics. But we must thank ME3 airlines for their timely service no matter what is the economic environment i! Also white color Bongs, please don’t leave that place for good, it is not all that gloomy. You have to take care of your own land and not central govt! Four strong lights are PAPI of secondary runway 01R south side. https://youtu.be/JNDbBOdstio I am in disagreement with this video. The most comfortable airport in INDIA is DEL- IGI !! Day time landing on secondary runway: https://youtu.be/cQ8m37mNIRA Please note solar panels on the east side of main runway. Sept. 26: The rush to return home during Puja or escape the festive chaos has resulted in a record spurt in footfall at the city airport. On Sashthi, NSCBI Airport registered a never-before passenger count of 60,000. The average daily figure is around 35,000. As many as 52,000 of the the 60,000-odd passengers who passed through the airport were domestic fliers. The skewed distribution is hardly surprising, given the handful of international flights the airport handles. To manage the rush of domestic passengers yesterday and today, the airport authorities had to tap the under-utilised infrastructure of the international section. "In the security hold area, where passengers wait to board the flights, we have created a swing door to allow four boarding gates of the international section to be used by domestic passengers," airport director Atul Dixit said. An official said 26,281 domestic and 4,235 international passengers flew out of the airport yesterday. Almost an equal number arrived in the city. There were long queues at the check-in counters and the X-ray machines of the domestic airlines. In the arrival area, similar queues were seen at the pre-paid taxi counter. Puja is the time when tens of thousands of Calcuttans who work or study outside return home. "This is the second year I am outside Calcutta and I realise that I can't miss Puja at any cost," said Aishwarya Mukhopadhyay, an undergraduate student at St. Stephen's College, Delhi. She will return home on Saptami. The airport usually wears a deserted look during most of the day - except the morning and afternoon rush hours. But throughout today flights to and from the city were almost full. This Puja, Darjeeling and Sikkim are out of bounds for tourists because of political turmoil in the Bengal hill station. "Instead of Sikkim and Darjeeling, tourists from Bengal are exploring more of south India this year. We are experiencing a surge in demand for the destinations such as Munnar, Wayanad, Kumarakom and Kabini (Kerala), Coorg (Karnataka), Ooty, Pondicherry and the Andamans," said Karan Anand, head, relationships, Cox & Kings. The passenger surge at the airport started on September 21, the day the footfall soared to 45,000. Despite the surge in the flier count, the air fares over the next few days are within the "normal range". A one-way fare from Bangalore to Calcutta was about Rs 6,000 this afternoon. It was around the same for a one-way trip from Calcutta to Mumbai. Tour operators said seats were available on several flights to and from Calcutta. "Over the past two years, the number of flights from Calcutta has gone up manifold. The number of domestic passengers has also increased but not proportionately. So, the price surge and the scramble for seats that we used to see during the Puja is not there," said Anil Punjabi, chairman (east), Travel Agents Federation of India. Yesterday, 189 domestic flights had taken off from Calcutta, compared with 147 flights around this time last year and 112 in 2015. Comment: Hope Kolkata will reach 20 M passenger by the end of this year. Hercules lends strength to Panagarh air base . Panagarh, Oct. 6: The Panagarh air base of the Eastern Air Command is readying to emerge as a strategic hub in the east with the induction of the C 130J Super Hercules aircraft, the second base in the country after Hindon, off Delhi, to have the world's most advanced tactical airlifter. The Special Force of Hercules squadron in Panagarh in West Burdwan, which was raised only a month back, has begun preparing itself 24x7 keeping in mind the developments across the border in China. Officers said one could fly to the Chinese border from Panagarh in less than an hour on a C 130J Super Hercules. "The runway of the Panagarh airbase has been refurbished to accommodate all types of fighter planes. We are in a state of heightened alert and ready to face any air-challenge," said Air Vice Marshal Vikram Singh, Air Officer Commanding (AOC), Advanced Headquarters, Eastern Air Command. "It would take us less than an hour to reach the Chinese border from here." Constructed in 1944 by the United States Army Air Force, the Panagarh air base was used extensively during World War II. The base played a key role during the 1965 and the 1971 India-Pakistan wars and was rechristened Air Force Station Arjan Singh in 2016 after the late Marshal of the air force. Sources said the IAF bosses had set their sights on the Panagarh base around June, when a border stand-off between India and China started over the construction of a road by the Chinese on the disputed Himalayan plateau of Doklam. Reason: The base is not too close to the Chinese border and yet not too far away. Panagarh is ideally located to have in its fleet Super Hercules aircraft, which can deploy troops in a hostile territory in a short notice. Panagarh has also been identified as a base for a section of the Mountain Strike Corps, a high-altitude infantry division with "quick reaction ground offensive capabilities". "The Mountain Strike Corps is headquartered in Ranchi and some of its elements would be in Panagarh," Air Vice Marshal Singh said. Insiders said the combination of the air force and the army in and around Panagarh signaled India's capability to strike across the border, if required. Officers said they were looking for land to expand the base. While talks have started with the district administration and the air headquarters, there hasn't been much progress. "Land acquisition is a time-taking affair and talks are on," an officer said. Comment: After Doklam crisis and use of high altitude toops in China border, the importance must go up. This area will be a major commant/control center for tha nation! With the winter fog in sight, the Netaji Subhash Chadra Bose International Airport will soon be CAT-IIIB compliant, which will allow aircraft to land even under 50-metre visibility. At present, an aircraft requires at least 350-metre visibility to land safely at the airport. The central government had announced the upgrade in December 2015. “The upgraded runway (that is CAT-IIIB compliant) will be operational from November. With the new system, the delays due to fog during winter will be brought down to a great extent,” said Atul Dixit, Airport Director. The main runway has two sides – one for planes landing from Madhyamgram area and the other for flights that land from Rajarhat area. The Madhyamgram side will remain CAT II compliant while the Rajarhat side will be upgraded. The work to upgrade the runway began last year. As per a technical expert it is good that the work related to upgrading the runway is near completion but it is equally important to see if Boeing aircraft are equipped to use CAT IIIB ILS. It is important that they have trained pilots too, they said. Comment: Both sides of main runway should have CAT IIIB compliant. But South side ( Rajarhat side ) flight path passes over densely populated build up area. It good to have CAT IIIB on this side . PANAGARH: Jumping out into the night sky at 30,000 feet with equipment weighing more than 40 kilograms and a military parachute, which weighs 20 kg. It's just the start of an operation for the Special Forces of the Indian Army. The parachute can take them up to 40 km into enemy territory within 45 minutes if the drop is perfect.Before long, Air Force Station Arjan Singh in Panagarh -about 150 km from Kolkata -will turn into a training base for paratroopers. AFS Arjan Singh became the second air base in the country after AFS Hindan, where the C-130J Super Hercules strategic transport aircraft got stationed a couple of months ago during the standoff between Indian and Chinese troops at Doklam. From a base that was best remembered for its China-Burma-India operations during World War II, AFS Arjan Singh has evolved into a primary asset for the IAF. Paratroop Instructors (PI) from the Paratroopers Training School (PTS) in Agra have already set up their base here to train Special Forces for operations at night, even beyond the country's borders. enable to spend more time in the air. The infra-red sensors in the front allow the people inside to have a monochromatic view of the surroundings, allowing operations at low levels in the night. The Super Hercules is capable of precise tactical air drops," said, Air Vice Marshal Vikram Singh, air-officer-commanding, advance headquarters, Eastern Air Command. On Friday, a C-130J Super Hercules of the recently commissioned Raiding Raptors (Squadron 87) showcased its paratrooping role by taking off with seven PIs and dropping them from 8,000 feet over the base within a few minutes. Air Vice Marshal Singh added the aircraft can be used for counterinsurgency operations by Special Forces in the North East. Dum Dum: A surge in domestic traffic and stunted growth in the international sector have prompted the airport authorities to hire an American consultancy to reorient its expansion plans. Landrum & Brown, which specialises in aviation planning and development, will review the master plan for the airport's expansion and recommend changes based on utilisation of the facilities. According to the company's website, it has done similar master plan reviews for two privately managed airports in India - Delhi and Hyderabad. The firm has also sketched assessment plans for Dubai, Abu Dhabi, Shanghai, Los Angeles, Melbourne and Thailand airports. "The firm will start the study early next month. The master plan was drawn in 2008-09 and the aviation scenario has since undergone lot of changes. All these factors now have to be included," airport director Atul Dixit said on Sunday. Passenger traffic to and from the city has increased in the last few years, but this growth has been mostly in the low-cost domestic sector. The passenger count in the domestic sector increased by almost 26 per cent in 2016-17 over the previous year - from 12.8 million to 15.8 million. But growth was stunted in the international sector with 2.3 million passengers in 2016-17 against 2.15 million the previous year. The widening gap between domestic and international passenger traffic has led to inequity in the use of the integrated terminal's resources. The international section is busy mostly late in the night while the domestic wing handles multiple flights all day. This creates a situation where domestic passengers have to be transferred to aircraft by bus while aerobridges in the international wing remain unused. Airport officials said that besides prioritization, the reworked expansion plan would include more parking bays for airlines that have ordered new aircraft and are looking to scale up their domestic operations. The authorities are also planning to increase the capacity of the main runway from 30 flights an hour to at least 42. Comment: Convert at least three international aerobridges to duel use aerobridege without delay. This should not take much time ! Put to use old domestic terminal without delay. There is no point to let it sit like a rock. Then install three aerobridge on north side of this terminal. This terminal could easily handle 7-8 million domestic passenger. Reschedule more domestic flights to off peak hours. Remember Kolkata domestic civil aviation market is extremely hot beyond the imagination of MCA babus! Encourage airlines to use more wide body aircrafts in trunk routes. With modern aviation technology CCU could handle 40 million passengers easily. The question of third runway, more terminal space arises till traffic count reaches 40 million soul. Then AAI may have to look for third runway or alternate airports nearby. May be Kolkata needs a Tubo only airport at that time. Extension of F taxiway north and parallel taxiway in the east will also help to reduce conjestion. Good Luck! KOLKATA: Before long, Indian Air Force (IAF) jets could be repeating Tuesday's drill on the Agra-Lucknow Expressway on a highway in West Bengal. The National Highways Authority of India (NHAI) has sent a detailed proposal on a 5km stretch of NH60 starting from Kharagpur in West Midnapore district of Bengal extending up to Balasore in Odisha that may be used as an alternate runway for IAF aircraft. On Tuesday morning, an IAF C-130J Super Hercules landed on the Agra-Lucknow Expressway and deployed Garud commandos who 'secured' the alternate runway for 15 fighter aircraft to carry out roller/touch-and-go manoeuvres on the highway. After that, the C-130J landed once again and de-inducted the commandos. Apart from the expressway, IAF has identified 11 stretches on highways across the country that may be used for landing. "We had two alternatives. One option was the stretch between Kharagpur and Keonjhar. The other was between Kharagpur and Balasore. Finally, the latter proved a better option. We have sent a proposal with all details to the ministry of road transport and highways. We have a 60-metre-wide corridor that runs for five km. This should be sufficient for fighter aircraft of the IAF. We think that the proposal is being scrutinized by the ministry and the IAF," said T K Baidya, project director, NH60, NHAI. The location of the highway is close to Air Force Station Kalaikunda and is ideal as a diversionary runway so far as logistics support is concerned, a senior IAF officer said. Alternate runways can be used if the air base becomes unusable due to enemy action during a conflict. "Highways can also be used as runways to reach humanitarian aid during disaster relief operations or evacuate people. The Kharagpur-Balasore stretch is strategically located as it connects West Bengal and Odisha," the IAF officer said. Comment: They could also land on Red Road ,Kolkata , as they used to during WW II! Toll booths are creating traffic jams! There number should be increased. Emirates landing at Kolkata airport, night time: https://youtu.be/wrdIpB_STtg .Please note vast land in the east now under airport area. Addtional floor space, X-ray machines at Bagdogra airport. KOLKATA: Next time travellers take a flight out of Bagdogra after visiting Darjeeling, Gangtok or the Dooars, the experience will be more pleasant than it's been during the tourist season. Endless queues at the registered baggage screening point, check-in desks and security check followed by jostling for seats at the security hold at Bagdogra airport have left many tourists miffed at their pleasant holiday experience being spoilt at the fag end of the trip. Flooded with complaints this summer when traffic surged to a new high and the airport battled severe congestion, authorities have taken multiple measures to unclog several bottleneck points to improve the experience at the airport. On Friday, Airports Authority of India (AAI) regional executive director (east) K L Sharma unveiled several measures that had been taken at the airport. "We have doubled the number of X-ray machines to screen registered as well hand luggage and significantly increased space in the security hold area. Though the terminal is already saturated way beyond its capacity, these measures will give it some breathing space before issues are sorted out for a bigger new terminal," said Sharma. Bagdogra airport director Rakesh Sahay said the new area that had been created by combining the restaurant and visitors' gallery would provide 150 additional seats to take the count to 650. "We can seat passengers of four flights, up from three now. We have also added a boarding gate to take the number of gates to four," he said. The additional X-ray machines have similarly increased the baggage scan capacity from 1,200 (600 registered and 600 cabin) bags an hour to 2,400 bags an hour. The two old X-ray machines at the registered baggage screening point have been scrapped and four new ones have been installed in addition to two new machines at the security check point. At present, the airport has 20 flights daily. The flight count will increase to 22 this winter. Most of them are between 12pm and 4pm. The most congested period is between 2pm and 4pm when seven flights arrive and six depart. Overall, the floor space in the terminal has increased from 5,400 sq metres to 6,000 sq metres. But it is still a squeeze as traffic at Bagdogra has been growing at a phenomenal pace. Between January and September this year, passenger count grew 62% against the numbers clocked in corresponding period last year. "Bagdogra airport handled 1.5 million passengers in 2016. This year, we will comfortably cross 2 million which is twice the terminal's handling capacity. We are hoping the impasse over land is resolved so that a new terminal can be built," he said. AAI has asked the state to provide 100 acres adjacent to the airport to construct a new terminal and increase the apron area to create more parking bays. It plans to invest around Rs 1,500 crore for the expansion in three phases. Comment: If peace persists in the Hills it might be the fastest growing desi airport! Kolkata: Trials for operating flights in dense fog and smog have been completed at the city airport, paving way for the commissioning of an instrument landing system (ILS) that allows landings and takeoffs even when visibility drops to 50 metre. At present, flights can operate up to a minimum visibility of 350 metre. “We have completed three trials by qualified pilots on clear days when visibility was over 5,000 metre as stipulated by the regulator. The report of these simulations are being compiled to be sent to the Directorate General of Civil Aviation (DGCA) for approval. Once it arrives, we will notify airlines and pilots through the Aeronautical Information Publication of India (AIPI) that Category IIIB ILS is available at Kolkata airport. Thereafter, any pilot qualified to operate in CAT-IIIB conditions can touch down or take off even when visibility is extremely poor,” a source at Kolkata airport said. CAT-IIIB ILS will help guide pilots with radio signals and high-intensity lighting to land during difficult visibility conditions. An automatic landing system is mandatory for CAT-III operations. The runway lights will also allow flights to takeoff when visibility is beyond 125 metre. While the DGCA nod is expected some time December, the notification could happen only in January. Kolkata airport usually experiences fog towards December-end, which persists through January. The good news is that once the airport is notified as CATIIIB compliant, runway visual range (RVR) or the distance till which a pilot can see clearly will not matter unless fog is so dense that there is near-zero visibility. Most of the aircraft, other than ATR, will be able to operate in low visibility. Till now, Kolkata airport had CAT-II ILS that is installed at the north or Madhyamgram-end of the primary runway. The CAT-IIIB ILS has been installed at the south or Rajarhat-end of the runway. “During winter, there is a northerly wind. So, flight operations are easier if landings are towards the north. Hence, planes touch down at the Rajarhat-end, where we have CAT-IIIB ILS as visibility usually drops during winter,” said airport director Atul Dikshit. This year, there had been flight disruptions one October morning when visibility plunged below 350 metre. The previous disruption was in March this year. The new ILS will also come in handy during heavy rain. It will, however, come to naught if the primary runway is out of operation. The secondary runway is equipped with only CAT-I ILS that can aid pilots only if visibility is over 550 metre. “Till now, only Delhi had CAT-IIIB facility. Now, Kolkata, Jaipur, Lucknow and Amritsar that also experience heavy fog have been equipped with the advanced ILS. Next, Guwahati will get it,” said AAI regional executive director KL Sharma. Once CAT-IIIB is operational at Kolkata airport, flight operational reliability will improve and passengers will not have face the hassle of having to wait for visibility to improve. Airlines, too, will benefit as the average cost of diverting an aircraft is Rs 10 lakh. “This is a win-win situation for everyone,” said captain Sarvesh Gupta, chairman of the airlines operators committee at the airport. Posted: Sun Nov 19, 2017 5:59 pm Post subject: More slots at NSCBI airport. KOLKATA: The authorities at Kolkata airport are working on an ambitious project that would open up five additional slots each hour for landings and takeoffs. Expected to be in place by a month, this will mean more flights during rush hours. At present, the airport can handle a maximum of 30 flight movements an hour or a flight every two minutes. The air traffic management (ATM) team though believes runway efficiency can be increased further to accommodate at least 15 more flights. But that would have to happen in two phases; first increase the number to 35 and then push for 45 or even 48. Study on the first phase to reduce distance between incoming flights so that they can land in quick succession is nearing completion. At present, aircraft coming in to land maintain a separation of 7 nautical (13km) when there is notakeoff in between and 8 nautical miles (15km) when there is a takeoff. This will be reduced to 6 nautical miles (11km) when there is no takeoff and 7 nautical miles (13 km) when there is a takeoff. Air traffic control officers are already undergoing training to handle flights with reduced separation and airlines will be briefed soon. Also on the anvil is a meeting with pilots to ensure they don't spend an extra second on the runway. "Runway occupancy per flight must reduce from over 1 minute now to around 50 seconds. Planes that touch down have to exit at the earliest. While those that depart must start the takeoff run as soon as they enter the runway. It is all about precision," an ATM official said. He said airport authorities expect these measures to be in place next month, Kolkata airport will be able to handle 35 flight movements in an hour from December-end or January-beginning. In the second phase, the rapid exit taxiway at the southern end of the primary runway will be extended beyond the secondary runway till the main taxiway that runs parallel to the runways so that flights can exit at speeds in excess of 50-70 knots or 90-130 km/h instead of 20-25 knots 37-45 km/h now. Lower the speed of exit from the runway, more is the time spent on the landing strip. "A rapid exit taxiway has to be at an angle of 25° to 45° to the runway. Its length should also be 560 metre. The rapid taxiway that was constructed meets the criteria. We have some operations issues for which it is not used for rapid exit. We should sort out these issues in six months," said an official. Once these measures are in place, it will open up slots for five more flights every hour. That will come as a huge welcome move for airlines vying for prime time operations. To further enhance operations, a taxiway has to be linked at the head of the primary runway. At present, the entry into main runway is ahead of the start line. Planes go to the start point and then do a U-turn to make the takeoff run. This wastes precious time. Also a rapid exit taxiway has to be created to the north of the primary runway so that planes can exit quickly if they land at the southern end. Similar provisions have to be made for the secondary ruway that is used when the primary runway is shut for maintenance. "Work on the second runway will begin soon. But doing anything at the northern end of the primary runway can happen only after the mosque that is there within the airport premises is relocated," the official explained. If that happens, Kolkata can handle 45-48 flights an hour. Comment: Relocation of mosque is out of question. But AAI can build a parallel taxiway in the east of main runway. Or they could build a interlinking taxiway between the two runway at the northern most point of main runway. Both or any one of them could reduce runway occupancy significantly.They may have to remove clumsy solar panels all together. Aircrafts approaching to land from north do not have to spend much time as most taxiways are connected on south side of both runways. But those landing from south are forced to take long taxing time and increases runway occupancy.All future taxiways/ parking lots in the north have to be build around the mosque. British Airways is introducing a boarding policy that means those buying the cheapest seats will be called last. From 12 December, passengers will be assigned a number between 1-5 printed on boarding passes, with the highest figure reserved for economy fares. BA said the move is about simplifying the boarding process, and bringing it into line with other carriers, including American Airlines and Iberia. But BA was accused of operating a class system and further eroding perks. The number "one" will be given to first class passengers, with others assigned to other segments such as Executive Club or World Traveller Plus. Passengers who are travelling with children or have mobility issues will still be able to board ahead of everyone else. A BA spokeswoman said: "We are always looking at ways to improve and simplify the airport experience for our customers... Next month we are introducing new boarding procedures to speed up the process and make it simpler for customers to understand. "This method has been used by airlines around the world for a number of years, including by our partners American Airlines, Iberia and Qatar. Comment: would you still fly BA? Calcutta: The volcanic eruption in Bali has left several Calcuttans stranded on the Indonesian holiday island. Bali airport was shut on Monday after Mount Agung spewed volcanic ash high into the sky, forcing airlines to cancel hundreds of flights. AirAsia's Calcutta-Bali flight, which had its maiden take-off on October 3, was among those that did not operate on Sunday and Monday. The flight scheduled for Tuesday also stands cancelled, an official of the airlinesaid. Since this is currently the only direct flight from Calcutta to Bali, tourists from the city stranded there have little option but to count the days. Sources in AirAsia said flights to Bali hadn't been running full lately because the expected winter rush of tourists was still some weeks away. As and when the airport reopens - even if temporarily - the stranded passengers would be taken to Kuala Lumpur and put on flights to Calcutta from there. "AirAsia will continue to be in close coordination with the authorities and provide updates on the latest developments," the airline said in a statement. The budget airline operates the flight from Calcutta to Denpasar, the capital of Bali, four days a week with a stopover in Kuala Lumpur. The flight takes off on Sunday, Monday, Tuesday and Friday. Tour operators said Bali, known for its surf, beaches and temples, has become one of the top tourism choices in Asia for Calcuttans. "It's a very popular choice among honeymooners. There are a lot of repeat tourists too," said Anil Punjabi, chairman (east) of the Travel Agents' Federation of India. Dum Dum: Calcutta airport is ready to beat the fog this winter with its new Category III-B Instrument Landing System that enables a pilot to land an aircraft safely in low visibility up to 50 metres. An inspection on Tuesday by a two-member team from the Directorate General of Civil Aviation (DGCA) completed the final round of clearance for CAT III-B ILS to be switched on. "The inspection of the runway lights, a crucial part of CAT III-B ILS, has been done and we expect to make it operational soon," airport director Atul Dixit said on Wednesday. The number of lights on the centreline of the primary runway have been doubled as part of the upgrade from CAT-II to III-B. In the existing system, the lower visibility limit for a safe landing is 350 metres. CAT III-B has been installed on the southern side of the primary runway because the wind blows from north to south in Calcutta during winter. This means aircraft landing from the southern side are doing so against the wind, which is the norm. A tailwind would increase the possibility of an aircraft overshooting the runway while landing. The change in wind direction is the reason why, air traffic control officials said, residents of Ballygunge get to see more planes in winter than they do during the rest of the air. In summer, aircraft mostly land from the northern side of the runway, which is why people living in Barasat and Madhyamgram see more flights arriving. The CAT III-B system, which has been installed at a cost of Rs 130 crore, includes an advanced signalling mechanism and more lights on and near the runway and taxiways. In CAT II, there are approach lights along the threshold and centreline lights on the runway. The gap between two lights along the centreline of the runway is 50 feet in the CAT II system. This gap is halved in the switch to CAT III-B. The airport's primary runway is 11,900 feet in length. Centreline lights on the taxiways will guide pilots till the parking bays after landing. Two units of a signalling instrument called runway visual range transmissometer have been installed on the primary runway. These instruments send signals to a receiver in the aircraft, guiding it to the runway. In the CAT II system, a pilot is guided by the signalling system till 100 feet above the ground, when the runway isn't in sight. In CAT III-B, an aircraft can descend till 50 feet above the ground because of the advanced signalling system. Then the pilot would see the approach and touchdown zone-lighting system. In Calcutta, flight schedules are usually disrupted most in December and January, when fog strikes. CAT III-B is the second-most advanced instrument landing system available. No airport has CAT III-C yet. Most airlines operating in India already have pilots who are CAT III-B compliant. Comment: TORA ( Take off run available) for primary runway is 12500 ft. May be in near future the high rise complexes near 01R may also be removed for smooth landing in foggy condition.Who gave the permission to build such highrise near the approach path? Left front govt.? KOLKATA: The city will soon have a museum on the country's naval history inside a decommissioned aircraft. The state government has agreed in principle to maintain the display and is looking for an appropriate location where the nearly 175ft Tupolev Tu-142M will be placed. True to its nickname 'Albatross', the aircraft has a wingspan of 164ft. It would require m ore than half a soccer field to park it. "Apart from being a long range maritime reconnaissance aircraft, the Tu-142M was a 'submarine killer'. All six aircrafts were decommissioned from the Navy after 29 years of service earlier this year. One of these is placed at Vizag near the R K Beach, across the submarine museum. Work is on inside the aircraft to develop it into a walk-through museum. We planned to bring one of the aircrafts to Kolkata and took the matter up with the state government which is very keen," Commodore Suprobho K De, naval officer-in-charge, West Bengal said. He expects the government to decide on the location for the display by the end of the year, after which the Navy will transport the 90,000kg aircraft in parts and re-assemble it at the location. This will be the first such museum in Kolkata. Comment: Yes, full one third of desi NAVY made in Kolkata. But who cares! International passengers: CCU 217K, MAA 434K, BLR 304K , HYD 278K. Hope CCU will match up with MAA this yearend. Dum Dum: Calcutta's domestic air traffic will outgrow the current airport in some years but a second one can be built to share the load if the state government provides land, civil aviation minister Ashok Gajapathi Raju said on Tuesday. "Calcutta needs an alternative airport. This airport is not yet saturated but it will be soon because of the way traffic is growing," Raju said after commissioning a 15MW solar power plant at the airport. "But to build one, we need land. If the state government can provide land, we will build a greenfield airport." The civil aviation minister specified that the proposed facility would need to be built and run by a private operator. "We will provide the expertise and help the state government get a private party to build and operate it," he said. Netaji Subhas Chandra Bose International Airport is owned and run by the Airports Authority of India. Chennai is the only other state-owned airport in a metro. Bengal needs to arrange land, its main bottleneck, within a reasonable distance from the city to build a new airport. "We are talking about thousands of acres here, based on other airport projects. The new airport in Bangalore is spread over 4,500 acres while the one in Hyderabad spans 5,400 acres," said an official in the civil aviation ministry. State government officials admitted that finding thousands of acres for an airport near the city would be a problem. They recommended Andal, near Durgapur, as the potential second airport that minister Raju said Calcutta would need. But Andal is almost 200km away, and airlines have not shown any interest so far in operating out of there. "If airlines want to use Andal, there is no problem. But they have to show interest," the civil aviation minister said. So, how quickly would the city airport need backing up? Officials said growth in domestic flight operations rather than passenger volumes would test the airport. "We have land to build another terminal. Operations can be extended to the old domestic building as well. But the capacity of the runways and parking bays will saturate," airport director Atul Dixit said. The airport is currently equipped to handle 30 flights every hour. The target is to handle 35 flights an hour, which with a scale-up in capacity can go up to a maximum of 42, officials said. In terms of flights, the daily average is 415, which works out to a little more than 17 flights an hour. The airport's domestic traffic grew 26 per cent last year. According to officials, the problem is that all airlines want flight slots during the morning and afternoon peak hours. The airport has two runways but these cannot be used simultaneously. A minimum distance of 760 metres is required between the two runways for simultaneous use. Land constraints means a third one cannot be built. Comment: Kolkata will reach 30M passenger by 2025, but when will it reach 40M ? It is hard to predict! Central govt. may not want a large DEL style airport so close to border. We have to live with this Gatwick style airport for years to come. GOD bless KOLKATA! Budget passenger carrier IndiGo on Friday said that it will launch new flight services on the Lucknow-Sharjah-Lucknow and Hyderabad-Sharjah-Hyderabad sectors from December 29, 2017. According to the airline, it will also connect Sharjah to Kolkata, Kochi, Goa, Tirupati, Rajahmundry, Patna, Mangalore, Visakhapatnam, Chennai, Raipur and Bhubaneswar through connecting flights. “We are the first Indian carrier operating Sharjah flight from Hyderabad and also starting first and only Lucknow-Sharjah connection,” said Sanjay Kumar, Chief Commercial Officer of IndiGo. Dum Dum: Three Calcutta-bound flights had to be diverted on Wednesday afternoon - not because of fog, the usual culprit around this time of the year, but congestion triggered by an upgrade of the main runway at the city airport. The flights were diverted between 11.30am and 2.30pm, the period when the main runway was closed because of the upgrade and the secondary - also smaller - runway was in operation, airport officials said. Two IndiGo flights, from Ranchi and Dibrugarh, and an Air India flight from Chennai circled around NSCBI Airport for close to 30 minutes, awaiting a nod to land. "The pilots told the air traffic control that they did not have enough fuel to keep circling and the flights were diverted to Bhubaneswar," an official said. The flights came back to Calcutta later in the day. The official said the minimum lateral separation between two consecutive flights landing on the main runway has to be 7 nautical miles - or 12.964km. It means when a flight touches down on the main runway, the next in line to land has to be at least 7 nautical miles away in the air to prevent any collision. For flights using the secondary runway, the minimum lateral separation has to be 14 nautical miles - 25.928km. Why are the requirements different for the two runways? "The secondary runway is smaller and has Category I Landing System. The primary runway is fitted with the more advanced Category II Landing System. So, for reasons of safety, the flights scheduled to land on the secondary runway have to keep a greater distance among themselves," the official explained. On Wednesday, an upgrade of the taxiway forced the officials to further increase the minimum lateral separation for the secondary runway to 20 nautical miles - 37.04km. "This led to congestion, with flights hovering over the airport waiting to land," a source said. There was no such congestion on Thursday, he added. An extended boarding area with more aerobridges, 23 additional parking bays, a new surface for the secondary runway and India's highest-category instrument landing system (III-B) for the primary runway - the airport is in the middle of a Rs 1,000-crore upgrade. The new landing system, which will enable pilots to land when the visibility is as low as 50m, will be operational from January 4. Calcutta: The Bengal government has told Delhi it cannot provide the required 4,000 acres for the proposed second airport in Calcutta, for which the Airports Authority of India had requested it to arrange the land. The state has urged the Centre to develop the Andal airport as an "alternative" instead, although the Centre had rejected such a request earlier saying the two airports were too far apart at 190km. "It's not possible to arrange for 4,000 acres in Calcutta's neighbourhood. If the requirement were 1,500 acres, we could have tried to find the land in Bhangar," a state official said. Nabanna sources said the state government's policy against forced acquisition was a factor too. They said senior bureaucrats had met AAI officials and told them they cannot find the land, and revived the Andal proposal. "Developing the Andal airport is the only way to manage the growing pressure on Calcutta airport. If the Centre has problems declaring Andal a second airport for Calcutta, it should consider it a standalone, alternative airport," an official said. AAI chairman Guruprasad Mohapatra said in Delhi recently that each of the four metros needs two airports. "Sites have been identified for Delhi and Mumbai. Tamil Nadu will finalise the site (for Chennai) shortly. Bengal is yet to do that for Calcutta," he had said. Sources said the Bengal government had told the AAI that the infrastructure at Andal was almost ready and stressed that its 2.8km runway could accommodate mid-sized aircraft. "The only thing the AAI needs to ensure is that air traffic control operates round the clock in Andal," an official said. He said the current problem could have been averted had the erstwhile Left government taken the initiative to expand the existing airport when New Town was being planned in Rajarhat. Comment: Does Kolkata need another airport? Current infra of NSCBI airport could handle easily 25-30M passengers most of whom are domestic. So I think this airport will be OK till 2030. The industrial landscape is in terrible shape. White color bongs are leaving the city by thousand. No sign of large, medium industry growth. A few IT will benefit white color people. So probably there is not much incentive for building another airport. But if it becomes necessary then land gobbled up by refugees, could be reclaimed by AAI in the East and north west ( Michael nagar area). Both international and domestic cargo terminals could be relocated freeing up valuable apron space. If AAI could link up taxiway F north to R19 ramp / RESA area, capacity of secondary runway will go up significantly. Such a reorganized airport may handle 50+ M passengers. Will city folks welcome such upgrade? With changing demography, it is worth investigation. Taxing and take off at NSCBI airport: https://youtu.be/dIvqXmGP1aQ Note land filling / construction activities in the distance. Landing at Kolkata airport; note new parking area construction not updated by Google Earth; https://youtu.be/NHdg5CLkBsQ . This site is near old Air India hangar location. In and out from the NSCBI terminal: https://youtu.be/MYSBMe9JZww It seems Miss Mamota has cleaned up VIP road with a broom stick! Please note passengers are coming for ramp loading from old domestic terminal building. Also complete absence of one old hangar in south side hangar complex. Cat IIIB compatible lights clearly visible on main runway. Good job! Daytime taxing on Secondary runway and Kilo taxiway: https://youtu.be/Bimv9aQZb3E . Land clearing in the east side of main runway clearly visible. One new parking lot added in cargo parking area designated as C5. Dum Dum: A series of checks, technical drills and best practices is preparing the airport for the launch of the CAT III-B instrument landing system on Thursday, coinciding with a projected fall in temperature and possibly also fog. The airport expects flight delays caused by fog to go down by at least 50 per cent once the new instrument landing system is switched on. Delays can be cut further if all airlines deploy pilots trained in the use of the CAT III-B system on aircraft operating to and from Calcutta whenever there is fog, an official said. Precision landing with a lower visibility limit of 50 metres will become possible after CAT III-B is operational. The CAT II instrument landing system currently in operation enables aircraft to land till a visibility cut-off of 350m. This is inadequate in Calcutta, where visibility often dips much lower in winter. Airport officials have been running technical checks on taxiways and also the centreline lights, another crucial component of the new system. The lighting along the centreline of the primary runway has been doubled. A meeting was held recently to identify parts of the runway, taxiways and surrounding operational areas where vehicle movement is restricted. When CAT III-B is in operation, any construction activity or other such work will be suspended. The authorities would also need to ensure that there is no equipment lying around the path of aircraft. "If visibility is low on January 4, flights will be able to land using the new system," airport director Atul Dixit said on Tuesday. Pilots trained in CAT III-B procedures have been practising landing in low-visibility conditions for a month. Airport officials said there had been 60-odd such landings with CAT III-B in the past 30 days. "For most of the time, visibility during fog is between 100 and 200 metres. Operational efficiency and reliability will go up by more than 75 per cent (with CAT II-B)," said Captain Sarvesh Gupta, chairman of the airline operators' committee at the airport. Dum Dum: Calcutta airport authorities have tweaked the main runway maintenance plan to reduce flight diversions. The main runway was closed for operations usually for three hours, twice a week, for routine maintenance work. At that time the secondary runway was used for flights to land and take off. But the taxiway that aircraft normally use to vacate the secondary runway is currently closed for operations. So, planes are taking double the time to clear the runway, causing congestion in the air, an airport official said. The authorities decided to change the maintenance schedule following several complaints from various airlines and the air traffic control. "Instead of three hours twice a week, we will keep the main runway closed for two hours thrice a week," an airport official said on Monday. The diversions took place in the third hour, when flights faced fuel shortage after being kept on hold mid-air for long, the official said. "The backlog got created in the first two hours... in the third hour, several flights had to be diverted because of a long waiting time," Captain Sarvesh Gupta, chairman, airline operators' committee, Calcutta airport, said. The maintenance work of the main runway is crucial to check wear and tear and the instrument landing system. It has to be carried out during the day, the airport official said. Metro had earlier reported how on December 21 three Calcutta-bound flights had to be diverted because of congestion triggered by the maintenance work. The minimum lateral separation between two consecutive flights landing on the main runway has to be 7 nautical miles or 12.964km. It means when a flight touches down on the main runway, the next in line to land has to be at least 7 nautical miles away in the air to prevent possible collision. For flights using the secondary runway, the minimum lateral separation has to be 14 nautical miles or 25.928km because the runway is smaller and has only category I instrument landing system. .
An upgrade of Taxiway F forced officials to further increase the minimum lateral separation for the secondary runway to 20 nautical miles or 37.04km. Aircraft use this taxiway to vacate the secondary runway. "Since it's closed, they had to use another taxiway and it took a long time to clear the secondary runway," the airport official said. News Analysis: Upgrading of taxiway F is urgent as it could be linked up with R19 ramp area increasing ACM through secondary runway. Also if PCN ( pavement classification number ) of the taxiway is increased then heavier aircrafts like B777 could use this runway. On the north side AAI should install an ILS antenna so aircrafts could land here bidirectionally. All these upgrades could push up runway usage to 30 per hour. There will be no problem in handling 40M passengers per year! Solar farm should have been developed in a remote area like Sunderban, leaving that valuable space near the main runway for apron and taxiway construction.AAI think hard!. No, Sir. You miss out on a few extremely crucial points: transmission, maintenance, and infrastructure. No airport with solar plants has its panels in a remote place. See Kochi for instance. It is an energy-neutral airport. Brilliant work! Further, it is possible to have solar structures without the glare issue. Colonies have rooftop panels within regulations, even in the glide slope area. DEL produces a good amount of solar electricity. No longer, Sir. That was primarily for Hawker Hurricanes. One needs highways good enough for heavier operations by faster planes. The Yamuna Expressway is superb. The Kharagpur Road being talked of is nice as well. It is nice to see this dual-use infrastructure coming up. Where have you been so long! Have you forgotten us or writing another trip report? Sir, on behalf of all forum members, please accept our sincerest condolences. I have gone through your report cursorially, I will read it in detail in the next few days. Calcutta: Kalyani in Nadia is among the places in Calcutta's neighbouring districts the state government is considering for setting up a second city airport, sources said on Wednesday. The Airports Authority of India (AAI) recently held two meetings with the state government - one last week - on availability of land for the airport. The AAI told the government the new airport should be ready by 2030, an official briefed on the meeting said. "In last week's meeting, the government agreed to start scouting for land. Ideally, the land should be within 30-40 km of Calcutta and should not be more than 100km away," AAI chairman Guruprasad Mohapatra said at NSCBI Airport on Wednesday. Sources said the government was looking for a plot spread across 1,300-1,500 acres. Kalyani is on the radar. "We are looking for land in adjoining districts. Kalyani is barely 50km from Calcutta. The town has research institutes such as the National Institute of Biomedical Genomics. An AIIMS (All India Institute of Medical Sciences) is also coming up there," a source said. Several factors, acquisition problem being one of them, have to be taken into consideration before a plot is finalised. Acquiring land for infrastructure projects has been a problem in Bengal. All upcoming Metro projects have been delayed by years because of land logjam. Sources said the AAI officials' assertion that the NSCBI Airport would reach a saturation point by 2030, and fail to handle demand after that, nudged the government into looking for land for a second airport. "We have told the state government that the new airport should be ready by then. Now, the (existing integrated) terminal is handling 18.5 million passengers. It will cross 26 million by 2030," said Mohapatra. The state government had earlier suggested that the airport be set up in Andal, near Durgapur and around 200km from Calcutta. But the AAI has rejected the proposal. It takes almost three-and-a-half hours to reach Andal from the city by road. "The second airport will also need multi-modal connectivity, including Metro. Andal cannot have such connectivity with Calcutta," said Mohapatra. He said the AAI has made similar requests to other states. Mumbai has a second airport coming up in Navi Mumbai. Near Delhi, an airport (Jewar) is coming up in Greater Noida. The Tamil Nadu government has zeroed in on a plot near Chennai for a second airport. Not just passenger handling, Mohapatra said, the Calcutta airport is also set to battle constraints in handling flights. The airport has two runways but they cannot be used for parallel operations because the minimum distance between them is below the statutory requirement. The runways are 282m from each, compared with the requirement of 760m. The airport earlier used to handle 35 flights an hour. Now, it's 40. A team from Denmark's Copenhagen airport will come to Calcutta next week to conduct a study on how to enhance capacity with the existing runway conditions. "Copenhagen has similar configurations like Calcutta. It has two airports that can't be used for parallel operations. But still they handle more flights," said Mohapatra. It has three runways; two intersecting and one independent. This airfield has numerous rapid exit taxiways, and parallel taxiways to main runways. This makes landing and takeoff much easier. No such things exist in Kolkata. Even main taxiway F is not covering the entire length of secondary runway. AAI should first finish up that then they could start comparing with Copenhagen. Geographically Kolkata airport seems to be more comparable to Gatwick and EWR airport and not Copenhagen. AAI should first take good care of current airport then think of having more land for another one! KOLKATA: Kolkata airport will begin construction of rapid exit taxiways at either ends of primary runway to reduce occupancy of the runway during landings and takeoffs. This will enable Kolkata airport to enhance flight operations by over 40% from a maximum of 35/hour to 50/h. The airport had only in December-end enhanced the capacity from 30/h to 35/h by slashing the distance between incoming flights as they arrive for touchdown. The urgency to take up the rapid exit taxiways project followed two days of brainstorming and onsite surveys between Airports Authority of India (AAI) officials and representatives from Copenhagen airport that handles 83 flights/hour with runway constraints similar to Kolkata. Like here where the primary and secondary runways is 282 metres against the requirement of 760 metres for parallel operations, the twin runways at Copenhagen airport also don't have the requisite separation but they have not only reduced the spacing between flights, the airport has also cut down on runway occupancy time to maximise runway efficiency. A four-member Danish team led by Claus Skajaerbaek has been in Kolkata since Sunday to work on the NaviAir project with AAI officials who have flown in from Delhi. "There is adequate space to the southern end as well as northern end of the runway to construct rapid exit taxiways. Once they are in place, the runway occupancy time of flights that land will go down from 45-50 seconds at present to around 30 seconds. This will help us reduce the separation between incoming aircraft to pack in more flight operations," an official who has been involved in operation NaviAir to increase Kolkata airport's runway efficiency told TOI. The angle of rapid exit taxiways have to be less than 45° to ensure that planes don't keel while moving off runway at a speed of 70-80 km/h after landing at 120-140 km/h. "Ideally, the angle should be around 30° and a minimum straight segment of 75 metres before the plane can take sharp turn into another taxiway," the official said. Though a rapid exit taxiway was built at the southern end of Kolkata airport's primary runway nearly a decade ago, it was never completed. While exiting the main runway at the desired angle, it does not have the minimum 75 metres straight line. Once the occupancy time of flights reduces, air traffic management team at Kolkata airport will return to drawing board and calculate how much separation can they reduce between incoming flights. In Copenhagen, the separation maintained is 3 nautical miles, half of Kolkata. They have achieved it with use of high-precision radar called Precision Runway Monitor that scans the sky at the rate of one per second, allowing monitoring of approach corridors with great accuracy. News Analysis: Subhro this is a fake news. Rapid exit taxiway ( Roger) started functioning about five years ago. A lot of youtube videos were posted in this forum about this topic. But I agree that in the north side of the air field time has come to build rapid exit taxiway bypassing the mosque! Alternatively R19 RESA and L19 turn pad could be joined You don’t need experts from Copenhagen for that analysis. Desi folks could evaluate that. AAI clean up your mind!! Dum Dum: The city airport does not have enough night-parking facilities for airlines to operate more flights at dawn, making it difficult for a traveller to reach even Darjeeling in time for lunch on the same day. The earliest flight to Bagdogra in Siliguri is at 10.50am, and the airfare is sometimes almost double that for an afternoon take-off, according to travel operators. Since all other flights are in the second half of the day, it means tourists visiting Darjeeling or Sikkim are often forced to spend a night in Siliguri or take the undesirable option of a hill journey that stretches well past dusk. There are either no morning flights or fewer than needed to several other destinations because the airport cannot meet the demand for night parking. Several airlines have complained about losing out on business since the majority of passengers, especially business travellers, prefer early flights. A morning flight invariably requires an airline to park the aircraft at the point of origin the previous night. The airport has 50 bays, of which around 35 are used for night parking, officials said. On an average, there are about 425 flights to and from the city. The current annual growth rate is nearly 18 per cent, increasing the need for more bays. Aircraft parked at the available bays operate mostly on the Delhi, Mumbai, Chennai, Bangalore, Guwahati and Port Blair sectors. The Jet Airways aircraft that flies to Bagdogra in the afternoon does duty on the Delhi-Calcutta sector before taking off for north Bengal as a separate flight. "One of our main issues is not having enough night parking bays here. Otherwise, we could have had a morning flight to Bagdogra and completed the return journey before noon," a Jet official said. AirAsia India is battling the same problem. The airline has been allotted one bay for night parking. Sources in AirAsia said the airline's senior management had approached the airport authorities and even chief minister Mamata Banerjee - the state government has no stake in the airport - for more night parking slots. Airport director Atul Dixit said 15 remote parking bays were being built on the eastern side of the terminal. The project is to be completed by September 2018. News Analysis: This is a most welcome news ; east side of airport should have been developed long ago. Encroachments and unauthorized building should be demolished and more parking lots could be built.